Anna Henry, a 63-year-old professional flute player, performed as she rested on the operating table with part of her scalp peeled back, undergoing brain surgery at Memorial Hermann-Texas Medical Center. Anna Henry's performance was the part of a surgical procedure called deep brain stimulation. The delicate notes of a flute filled the air of an operating room at a Houston hospital last Tuesday. While playing music during a surgery isn't unusual, this song wasn't being piped through a speaker system. The lilting classical tune was coming from Anna Henry, a 63-year-old professional flute player, as she rested on the operating table with part of her scalp peeled back, undergoing brain surgery at Memorial Hermann-Texas Medical Center. It was the first time in years that Henry, who has a common movement disorder known as essential tremor, played her favorite instrument with steady hands, KHOU 11 reported. Essential tremor is a neurological disorder that causes "involuntary and rhythmic shaking," most often in the hands, according to Mayo Clinic. Henry's performance was the part of a surgical procedure called deep brain stimulation, according to TMC News, Texas Medical Center's news outlet. The surgery involves inserting tiny electrodes in the brain, which deliver a constant electric current that can significantly reduce symptoms of conditions such as essential tremor or Parkinson's disease. A battery pack is also implanted in the patient's chest to control the amount of stimulation the brain receives, according to Mayo Clinic. Giving Henry her flute during the procedure allowed doctors to see if her hands were stable enough to play, and as her tentative fingers produced the melody's final notes, it was clear her operation was a success. These movement disorders are caused by circuits in the brain that function abnormally, Albert Fenoy, a neurosurgeon with the Mischer Neuroscience Institute at Memorial Hermann-Texas Medical Center and UTHealth, told TMC News. "Deep brain stimulation is a really fantastic tool in how we can modulate a perturbed, dysfunctional system in the brain and make it more normal," said Fenoy, who specializes in the procedure. Although exactly how deep brain stimulation works has not yet been fully determined, the surgery has been shown to have a high success rate for people, such as Henry, whose conditions can no longer be treated by just medicine, according to TMC News. Before the surgery, Henry had dealt with the tremor in her dominant left hand since junior high, after inheriting the movement disorder from her father, TMC News reported. But, as time went on the tremor intensified to the point where it was difficult for her to do simple tasks such as drink soup and sign her name, she told KHOU 11. Much to her horror, playing the flute - a talent she had been honing since she was 11 years old - started to become impossible. "You know what's in there and you know what you can do and you know what you feel and you just can't make your body do it anymore," said Henry, who is the principal flutist of Big Spring Symphony and a music teacher. "That's really frustrating." Even though she originally did not want "anybody poking a hole in [her] brain," Henry told TMC News that the prospect of surgery became less daunting as her symptoms worsened and the consequence of never playing the flute again became much more real. "I can fight it, but I'm tired of doing it," she told KHOU 11. "And it is getting worse. I know it's a matter of either admitting I can't do it anymore, or doing this [surgery] so that I can." People often hesitate to opt for brain surgery, Fenoy told TMC News, but added that those who do have surgery experience significant improvements. "All patients have success," he said. "Our goal is to greatly reduce their tremor. Will it be 100 percent gone? I don't guarantee that for any type of surgery, but the tremor will be 70 to 80 percent better than it is now." Before the electrodes were implanted, Henry could barely hold a cup of water steady, TMC News reported. But after the electric current was administered, Henry not only played the flute, she also signed her name with smooth strokes. Her handwriting was legible for the first time in decades. Henry's operating room concert is not the first time instruments have been played by patients during brain surgery. In July 2016, a music teacher played a saxophone during a procedure to remove a benign brain tumor that was "located in a part of the brain known to be active when people listen to and make music," according to NPR. 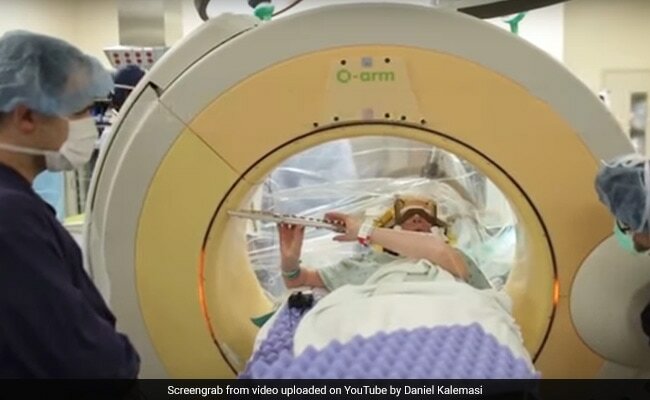 About a year later, surgeons in Bangalore, India were treated to a guitar performance as they operated on a man to correct a neurological condition called musical dystonia, which caused the patient's fingers to cramp, CNN reported. Patients are sometimes kept awake during these surgeries so doctors can monitor brain activity to ensure the right areas are being repaired and other parts of the brain are not being damaged, according to Mayo Clinic. "My folks lived through the [Great] Depression," Henry told TMC News. "If there's anything they taught me, it was that an obstacle is not something that stops you; it's something you find a way around."